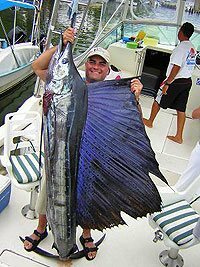 Join multiple tournament winner and lifelong Puerto Vallarta fisherman Captain Lalo and his expert mate Pete for a sportfishing trip of a lifetime. 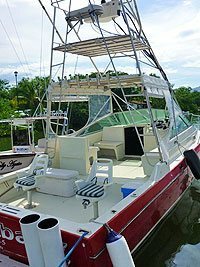 One of the fastest boats in Puerto Vallarta, this 34' rocket will get you to the big game fishing grounds in a hurry. Once you start fishing, you'll notice the open cabin design is specially built for landing big game. With a big 12x12 deck space, you can handle fish of any size, and still have plenty of room to move around, which is really nice. You can also troll up to 8 lines at a time, which means more chance of catching fish. These guys have brought in some monsters, maybe you can be next! Includes: 34' Sea Ray Express Sportfisher, All Fishing Equipment, Snorkeling Equipment, Bait, Bottled Water, Ice, English Speaking 2-Man Crew, Fishing License. Lots of Room to Land the Big One!